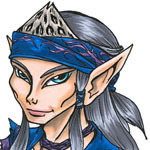 This is a brief introduction to all elves of the River Twine tribe, by generation. All artwork and stories that a character appears in is linked in their full character sheet - click on the picture, or their name for more information about them! (High Ones, ?-004) - male, silver-white hair, golden eyes. 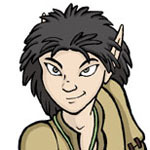 One of the Firstcomers and a powerful plantshaper, Aerlen was gravely wounded by attacking trolls. He was put into wrapstuff by the Preserver Chatterhop, and the glider Oriny took him to a refuge on Twin Peaks island. 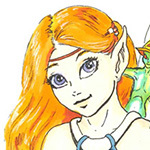 (High Ones, ?-004) - female, straight red hair, violet eyes. One of the Firstcomers and a powerful plantshaper, Befri was working alongside fellow plantshaper Aerlen to fix a hole in the defensive thornwall, when she was killed by attacking trolls. (High Ones, 380-499) -- male, brindle grey-brown and cream fur, gold eyes. A wolf-blooded son of the High One Zerran, and the father of Chieftess Wolfsister. Followed his daughter when she set out to form her own pack/tribe; was killed in a hunting accident during the journey. 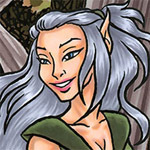 (High Ones, ?-004) - female, silver-grey hair, aqua eyes. 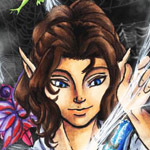 One of the Firstcomers, a glider who died while acting to save the plantshaper Aerlen, who was put into a cocoon when wounded in a troll attack. She flew the cocoon to Twin Peaks island and put it in hiding there, with a Preserver on guard; but she died trying to fly back to the mainland, before she could inform the other High Ones of the situation. 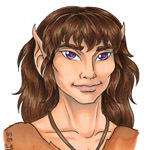 Bio picture by: Peggy B. and Melanie D.
(First Generation, 424-827) -- male, brown hair, violet eyes. 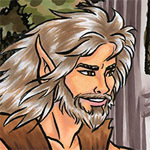 One of the wolf-blooded founders, Bravestride favored his elven side; a skilled hunter and tracker with an adventurous streak, who was also highly intelligent and quick-witted in a crisis. Part of Chief Burn's hunting party that was caught out on the grasslands during a summer wildfire. While the hunters all manage to escape, Burn, Bravestride and Raincaller were badly burned and died later of their injuries. Father of Sweetslip (with Wolfsister), Clawsharp (with Cubmaker), Squall (with Little Paw), Swan & Crest (with Knifemaker), and Spearpoint, Darkcurl & Sentry (with Deertracker). 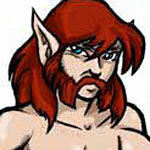 (First Generation, 428-852) -- male, red hair, dark eyes. 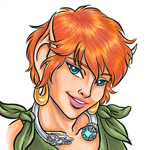 A pureblooded elf and the tribe's founding rockshaper. Recognized Wolfsister (fathered Dawn), Knifemaker (fathered Flint, Quillfeather, and Meadowlark), and Cubmaker (fathered Heron and Beartooth). 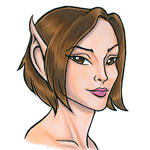 (First Generation, 369-725) -- female, brown hair, brown eyes. Although she was pureblooded, Cubmaker's fertility was impressive -- especially if you consider that she earned her name even before Wolfsister's band split off and went it own way. It's possible she had a touch of healing ability; was certainly an empathetic, gentle-souled woman. 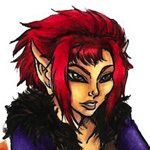 A skilled weaver, who brought with her the High Ones' art of turning Preserver webs into silk.Recognized Greenleaf (had Moondust), Crow (had Sparrow and Feather), Clayshard (had Beartooth), Redmane (had Firecat), and Bravestride (had Clawsharp). 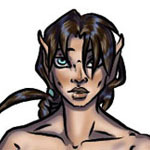 (First Generation, 457-604) -- male, brown hair, brown eyes. A pureblood, Recognized Wolfsister (fathered Hornet), and Feverease (fathered Ambergold). (First Generation, 460-998) -- 6'0" female; white-blond hair, grey eyes. 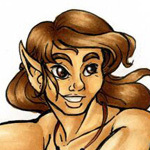 The tribe's founding healer, Feverease was a skilled herbalist as well as a strong healer. 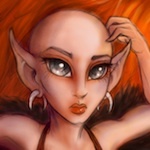 Wolfsister's closest friend and adviser, even through she herself was pure-blooded; was eager to see their small band expand its population, and took deep pride in every new birth (particularly those she "assisted" in sparking). 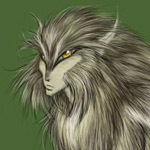 Lifemated to Wolfsister; Recognized Greenleaf (had Reedweaver and Smoke), and Eagle-Eye (had Ambergold). 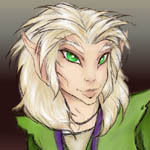 (First Generation, 390-1078) -- male, blond hair, green eyes. The tribe's founding plantshaper. Wolf-blooded. 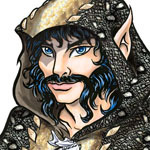 Recognized Feverease (fathered Reedweaver and Smoke), Cubmaker (fathered Moondust), Moth (fathered Raft), Sweetslip (fathered Oakhand), and Raincaller (fathered Blackbird, Pinecone, Ivy, and Raindrop). 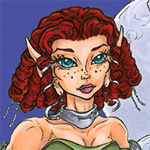 Bio picture by: art by Rachel V.; colors by Trena D.
(First Generation, 455-745) -- female, red hair, green eyes. Recognized Bravestride (had Swan and Crest), and Clayshard (had Flint, Quillfeather, and Meadowlark). 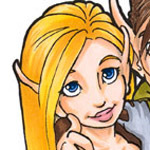 (First Generation, 499-993) -- female, dark blonde hair, amber eyes. 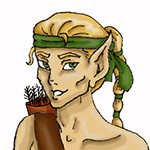 A pureblooded elf and one of the tribe's founders. Recognized Bravestride (had Squall), Crow (had Tadpole and Ripple), and Badger (had Toss). 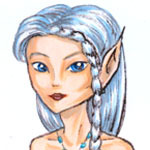 (First Generation, 403-697) -- female, white-gold hair, blue-violet eyes. Wolfblooded. Recognized Redmane (had Rosepetal), Crow (had Fisher), and Greenleaf (had Raft). 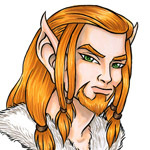 (First Generation, 274-776) -- male, red hair, brown eyes. 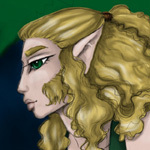 A pureblooded elf and one of the tribe's founders. A steady, confident hunter with a quiet, reserved nature. Recognized Wolfsister (had Burn, Deertracker, and Barkmoss), Cubmaker (had Firecat), and Moth (had Rosepetal). 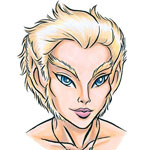 (First Generation, 477-666) -- 5'8" female, white-blond hair, green eyes. 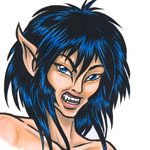 Founding chieftess of the tribe, daughter of Halfwolf who favored her wolfblood. An ambitious, competitive, aggressive hunter and natural leader who chafed under the rule of the Firstcomers and other High Ones, and struck off on her own, taking a small band with her that became the nucleus of the RiverTwine tribe. Lifemated to Feverease. Recognized Redmane, Clayshard, Bravestride, Eagle-Eye and Crow. Children: Badger, Bat, Burn, Deertracker, Barkmoss, Sweetslip, Dawn, Hornet. 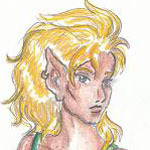 (Second Generation, 504-1189) -- female, honey-blond hair. A fairly strong healer, although not as strong as her mother. Daughter of Feverease and Eagle-Eye, sister of Smoke and Reedweaver. Recognized of Squall, mother of Owl, Harmony, and Spider. Died along with Ivy, Blackbird, and Streak during a bad summer forest-fire. 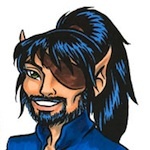 Bio picture by: Agathe W.
(Second Generation, 501-769) -- male, black hair, blue eyes. A rough and tough hunter, ambitious and temperamental, always expected to be Chief after his mother's death, but lost a contest-of-wills with his equally-ambitious half-brother, Burn. Son of Wolfsister and an unknown pureblood; Recognized of Littlepaw, father of Toss; Recognized of Raincaller, father of Bobcat; Recognized of Feather, father of Butterfly, Blue Jay & Softlock. 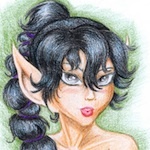 Bio picture by: art by Valkyrie, colors by Holly H.
Bio picture by: art by Rachel V.
(Second Generation, 606-672) -- 5'5" female, black hair, green eyes. Energetic and active, loving and caring, cheerful and outspoken. She was a jack of all trades, loving many different crafts, and she liked to make a game out of the tasks she undertook. She enjoyed night flights racing with Crow and Feather. 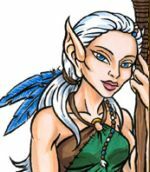 An avid hunter, she was both a skilled archer and excellent with a spear; and always carried several well-made thin throwing-knives that she liked to use while hunting as well. 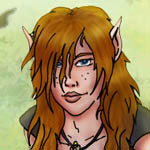 Daughter of Wolfsister and Crow, no full siblings but many half-siblings. Never Recognized nor reproduced. (Second Generation, 615-1249) -- male. 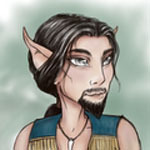 Son of Cubmaker and Clayshard; full brother of Heron; half-brother of Moondust, Sparrow, Feather, Firecat and Clawsharp. Recognized of Ripple, father of Piper, Burr & Minx. 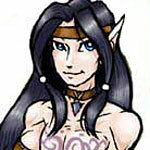 (Second Generation, 513-1189) -- female, black hair. Died along with Ivy, Ambergold, and Streak during a bad summer forest-fire. 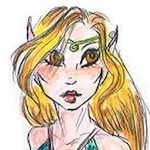 Daughter of Raincaller and Greenleaf; full sister of Pinecone, Ivy, and Raindrop. Recognized of Flint, mother of Cloudchase and Stoneback. 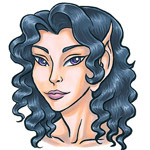 (Second Generation, 750-827) -- 5'4", dark grey hair, green eyes. Had the same hot-headed personality as her father Badger. Was angry that Burn was chief instead of her father, but did become friends with Burn's son Javelin. Together the two talked about how he would become chief after Burn, and she would be his hunt-leader. Was a good fighter and hunter, used two small axes. When Burn died, and the tribe chose Foxsly (who Bobcat had always disliked), she chose to leave the tribe, and although they searched for her, of course she was never found. Daughter of Raincaller and Badger; half-sister of Toss, Butterfly, Blue Jay, and Softlock. Never Recognized or reproduced. (Second Generation, 508-827) � 5'5" male, H=red, E=grey. The son of Wolfsister & Redmane, Recognized of Sparrow, and father of Foxsly, Red & Javelin. 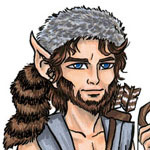 Burn was a short-tempered, cunning man who was determined to lead the tribe after his mother's death; won a contest of wills against his older brother, Badger. Fiercely dominant personally, could be a tyrant. (Second Generation, 508-1180) -- male, brindle brown hair, brown eyes. Son of Cubmaker & Bravestride. Recognized of Rosepetal, father of Growler, Catnip, and Whitebraid. 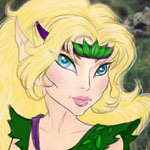 (Second Generation, 553-1034) -- female, blond hair, dark blue eyes. Daughter of Wolfsister and Clayshard. Recognized of Raft, mother of Tanner and Riversong. Bio picture by: by Maggie A. 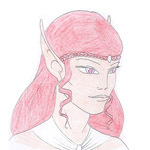 (Second Generation, 519-650) -- female, red hair, pale blue eyes. 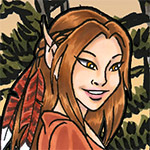 Deertracker was a lusty, earthy woman who excelled at the hunt and who had a bawdy sense of humor. Was killed by a bear who also mauled her son Spearpoint. Daughter of Wolfsister & Redmane, full sister of Burn and Barkmoss. Recognized of Bravestride, mother of Spearpoint, Darkcurl & Sentry; Recognized of Fisher, mother of Seafisher. 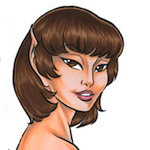 (Second Generation, 520-1274) -- female, dark brown hair, brown eyes. Daughter of Cubmaker and Crow, full sister of Sparrow. Recognized of Badger, mother of Softlock, Butterfly, and Blue Jay. 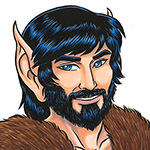 (Second Generation, 503-1401) -- male, dark grey-black hair, blue-violet eyes. Son of Moth and Crow. Recognized of Deertracker, father of Seafisher; Recognized of Smoke, father of Surefoot, Longdusk and Lure. 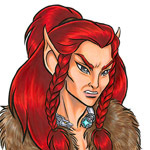 (Second Generation, 508-1069) -- male, fiery red hair, blue eyes. Son of Knifemaker and Clayshard; full brother of Quillfeather and Meadowlark. Recognized of Blackbird, father of Cloudchase and Stoneback. (Second Generation, 550-625) -- 5'10" male, brown hair, brown eyes. Heron inherited his father's rockshaping magic. 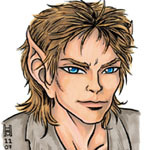 Although pureblooded, he idolized many of the tribe's wolfblooded elves, and wanted to emulate them; particularly Bravestride, and his older brother Flint. Became a good archer and hunter. Because he was pureblooded, he always had a hard time forming a bond with wolves, and he was too tall to ride them. But it was enough for him to feel at one with the pack, running alongside them on the hunt. Son of Clayshard and Cubmaker; full brother of Beartooth, half-brother of Dawn, Flint, Quill, Meadowlark, Moondust, Sparrow, Feather, Firecat and Clawsharp. 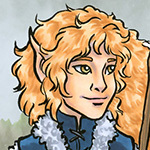 (Second Generation, 594-1077) -- male, blond hair, light brown eyes. Lost his right hand in a hunting accident, and it could not be saved. Came up with a variety of useful tools to put on the end of his arm, including a knife for hunting. Son of Wolfsister and Eagle-Eye. Recognized of Raindrop, father of Hailstone and Thistle. 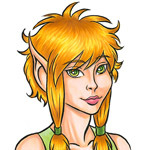 (Second Generation, 612-1189) -- female, golden hair, green eyes. Daughter of Raincaller and Greenleaf, full sister of Blackbird, Pinecone, and Raindrop. Recognized of Carver, mother of Diamond and Vine. Died along with Blackbird, Ambergold, and Streak during a bad summer forest-fire. 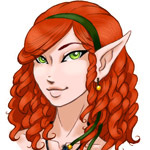 (Second Generation, 692-1398) -- female, light red hair, green eyes. Daughter of Knifemaker and Clayshard, full sister of Flint and Quillfeather. Recognized of Toss, mother of Pollen, Dusk and Wren. Very good friend of Raindrop. (Second Generation, 784-1039) -- female. Never Recognized or reproduced. 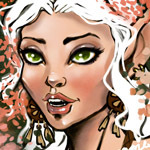 Daughter of Cubmaker and Greenleaf. 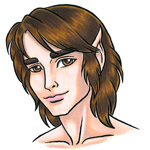 (Second Generation, 541-1028) -- male, brown hair, hazel-brown eyes. Son of Raincaller and Greenleaf, full brother of Blackbird, Raindrop, and Ivy. Recognized of Swan, father of Huntwise. 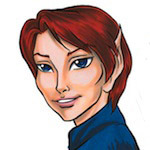 (Second Generation, 518-558) -- female, red hair, blue eyes. Never Recognized or reproduced. Daughter of Knifemaker and Clayshard, full sister of Flint and Meadowlark. (Second Generation, 589-1051) -- male, white-blonde hair, green eyes. Son of Moth and Greenleaf. Recognized of Dawn, father of Tanner and Riversong. (Second Generation, 633-1745) -- male, light brown hair, blue eyes. Despite having Recognized Foxsly three times, the pair never lifemated. 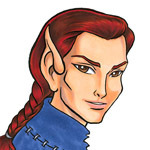 They shared the raising of their children, and Reedweaver had a number of serious lovemating relationships, including Blue Jay, Harmony and Hawkcall. Died during the distemper plague of 1745. Son of Feverease and Greenleaf, full brother of Smoke. Recognized of Chieftess Foxsly, father of Easysinger, Leather, and Frost. 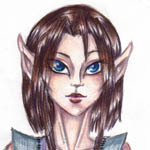 (Second Generation, 759-1442) -- female, brown hair, amber eyes. Daughter of Littlepaw and Crow, full sister of Tadpole. Recognized of Beartooth, mother of Piper, Burr, and Minx. 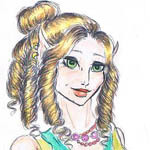 Bio picture by: Joan M.
(Second Generation, 574-1306) -- female, strawberry-blond hair, grey eyes. Daughter of Moth and Redmane. Recognized of Clawsharp, mother of Growler, Catnip, and Whitebraid. (Second Generation, 687-1365) -- female, silver-grey hair, brown eyes. Daughter of Feverease and Greenleaf, full sister of Reedweaver. Recognized of Fisher, mother of Surefoot, Longdusk and Lure. 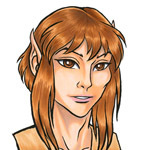 (Second Generation, 502-950) -- female, brown hair, gold eyes. Daughter of Cubmaker and Crow, full sister of Feather. Recognized of Chief Burn, mother of Red, Javelin, and Chieftess Foxsly. 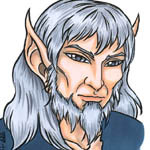 (Second Generation, 814-1016) -- male, silver-grey hair, grey eyes. Son of Littlepaw and Bravestride. Recognized of Ambergold, father of Owl, Harmony, and Spider. (Second Generation, 562-1745) -- female, white hair, violet eyes. Died during the distemper plague of 1745. Daughter of Knifemaker and Bravestride, full sister of Crest. Recognized of Pinecone (had Huntwise) and later of Barkmoss (had Herbfinder). 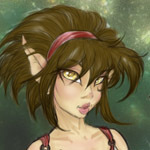 (Second Generation, 548-969) -- female, brown hair, green eyes. Daughter of Wolfsister and Bravestride. Recognized of Crow (had Carver), Greenleaf (had Oakhand), and had one child outside of Recognition, Streak. 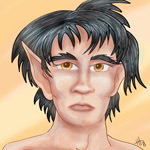 (Second Generation, 621-638) -- male, black hair, grey eyes. Died young, without Recognizing or reproducing. Son of Littlepaw and Crow, full brother of Ripple. 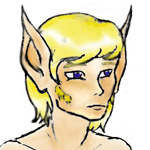 Bio picture by: Karena K.
(Second Generation, 712-1208) -- male, blond hair, hazel eyes. Son of Littlepaw and Badger. Recognized of Meadowlark, father of Pollen, Dusk and Wren. 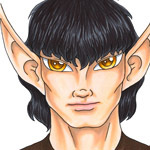 (Third Generation, 732-1130) -- male, black hair, blue eyes. Blue Jay was a witty, clever glider who excelled at fletching, and at trouble-making. Never Recognized or reproduced. Son of Feather & Badger, full brother of Softlock and Butterfly. Bio picture by: art by Maggie A. (Third Generation, 1191-1795) -- female, brown hair, gold eyes. Friend of Ice. Daughter of Beartooth and Ripple, sister of Piper and Minx. Recognized of Huntwise, mother of Joy and Dagger. (Third Generation, 724-1639) -- female, brown hair, blue eyes. Butterfly was a shy glider who avoided conflict or bloodshed. Enjoyed herbalism, fishing, and gathering shellfish. Daughter of Feather & Badger, full sister of Softlock and Blue Jay. Recognized of Spearpoint, mother of Strand and Stormdancer. 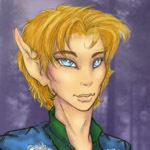 (Third Generation, 859-1514) -- male, blond hair, blue eyes. Died in a raging spring flood along with Harmony and Riversong. Son of Crow and Sweetslip. Recognized of Ivy (father of Diamond and Vine), and also of Harmony (father of Breeze and Diver). 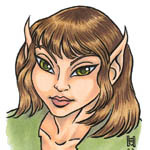 (Third Generation, 1065-1745) -- female, brown hair, green eyes. Died during the distemper plague of 1745. 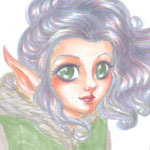 Daughter of Clawsharp and Rosepetal, sister of Growler and Whitebraid. Recognized of Stoneback, mother of Sedge, Agate and Beesting. 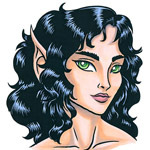 (Third Generation, 899-1403) -- female, black hair, green eyes. An early metal-worker. Daughter of Flint and Blackbird, sister of Stoneback. Recognized of Herbfinder, mother of Skinner and Summer. (Third Generation, 633-1502) 5'6" male, H=black, E=dark grey. Son of Knifemaker and Bravestride. 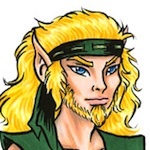 Soul-brother of Chieftess Foxsly (and died with her in the trolls tunnels); Recognized to Riversong and father of Hawkcall, Snaptwig, and Lacewing. Died on an expedition into the troll tunnels, along with his soul-sister, Chieftess Foxsly. (Third Generation, 592-1368) -- female, black hair, blue eyes. Daughter of Bravestride and Deertracker, full sister of Spearpoint and Sentry. 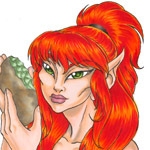 Recognized of Red, mother of Dapple, Skyfire and Autumntide. (Third Generation, 957-995) -- female. White-blond hair, blue eyes. Died without Recognizing or breeding. Daughter of Ivy and Carver, sister of Vine. 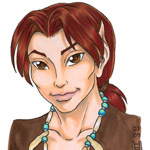 (Third Generation, 835-847) -- male, red hair, brown eyes. Never Recognized or reproduced. Son of Toss and Meadowlark, brother of Pollen and Wren (died before she was born). (Third Generation, 669-1502) 4'8" female, H=strawberry-blond, E=blue. Tribe's third chief. Daughter of Chief Burn and Sparrow, sister of Red and Javelin. 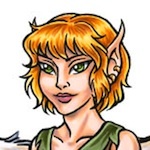 Soul-sister of Crest (both died in the troll tunnels) and Riversong, Recognized of Reedweaver; mother of Easysinger, Leather, and Frost, all by Reedweaver. 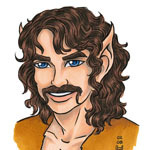 (Third Generation, 835-896) -- male, black hair, gold eyes. Died without Recognizing or reproducing. Son of Clawsharp and Rosepetal, brother of Catnip and Whitebraid. (Third Generation, 945-1745) -- male, brindle grey-brown hair, brown eyes. Died during the distemper plague of 1745. Son of Hornet and Raindrop, brother of Stormcloud and Thistle. Recognized of Piper, father of Wolfmane, Whirlwind, and Magpie. 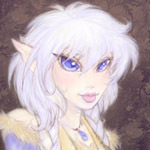 (Third Generation, 962-1514) -- female, white-gold hair, dark blue eyes. Died in a raging spring flood along with Carver and Riversong. 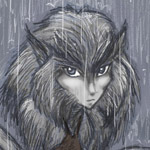 Daughter of Squall and Ambergold, sister of Owl and Spider. Recognized of Carver, mother of Breeze and Diver. (Third Generation, 912-1577) -- male, brown hair, brown eyes. Son of Barkmoss and Swan; half-brother of Huntwise. Recognized of Cloudchase, father of Skinner and Summer. 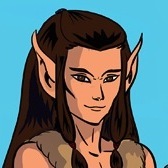 (Third Generation, 803-1794) -- male, brown hair, grey eyes. Son of Pinecone and Swan; half-brother of Herbfinder. Recognized of Burr, father of Joy and Dagger. 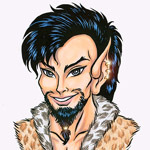 (Third Generation, 802-910) -- male, black hair, gold eyes. Took very much after his father: powerful, stern, little or no sense of humor; fierce hunter and tireless in pursuit, but not very creative. Also had his father's fiery, short temper. Considered himself the dominant one of the three siblings and assumed he would succeed his father as chief � thought Red was too submissive, and Foxsly too flighty and unreliable. Was surprised when brother Red and the majority of the rest of the tribe supported Foxsly over him (could not comprehend that it was **because** he was too much like his father, and the tribe was tired of that). Son of Chief Burn and Sparrow, brother of Foxsly and Red. Recognized Raindrop, had daughter Sundaze. Recognized Smoke, had daughter Puma. 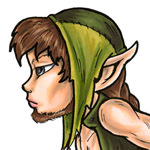 Bio picture by: art by Arthur R., colors by Holly H.
(Third Generation, 1052-1745) -- male. A gatherer and an herbalist. Died during the distemper plague of 1745. Son of Fisher and Smoke, brother of Lure and Surefoot, half-brother of Puma. Recognized of Minx (fathered Hooksharp), and Whitebraid (fathered Birch). 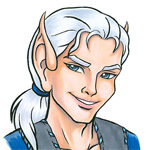 (Third Generation, 1227-1745) -- male, grey hair, blue-violet eyes. Died during the distemper plague of 1745. Son of Fisher and Smoke, brother of Longdusk and Surefoot, half-brother of Puma. Recognized of Vine, father of Cedarwing and Tangle. 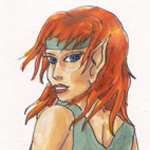 Bio picture by: Gina S., color by Holly H.
(Third Generation, 1218-1459) -- female, red hair, blue-green eyes. Daughter of Beartooth and Ripple, sister of Piper and Burr. Recognized of Longdusk, mother of Hooksharp. 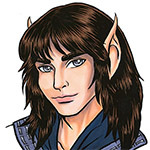 Bio picture by: Trena D.
(Third Generation, 1068-2045) -- 5'2" male, brown hair, blue eyes. Big, brawny Hunt-Leader, best known for being good-natured, difficult to upset or anger, fun-loving and prone to laughter, a good sport. Usually let the difficult moods of others roll right off his back. Had charisma and flair, but usually wasn't reckless. 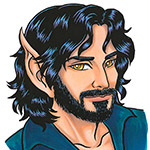 A fairly simple, straightforward elf, a little more wolfish than elfish, he always tried to balance what he saw as Easysinger's tendency to overthink things ("chew on a problem until it was damp and tasteless"). Loyal and very dependable. Chieftess Easysinger's long-time lifemate (prior to Blacksnake), but their one child died young. 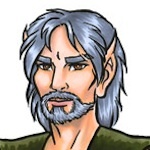 (Third Generation, 910-1745) -- 5'5" male, silver grey hair, grey eyes. The tribe's last healer (until the present day), Owl went mad when a plague decimated the tribe, and he had to be killed by Chieftess Easysinger. Died during the distemper plague of 1745. Son of Squall and Ambergold, brother of Harmony and Spider. Recognized of Wren (father of Dove, Melody, and Reed), and later forced Recognition with Beesting (fathered Raven). (Third Generation, 1046-1745) -- female, red hair, blue eyes. Died during the distemper plague of 1745. Daughter of Beartooth and Ripple, sister of Burr and Minx. Recognized of Hailstone, mother of Wolfmane, Whirlwind, and Magpie. 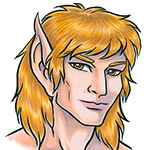 (Third Generation, 1199-1226) -- male, honey-blond hair, olive-green eyes. Inherited rockshaping through his mother Meadowlark (daughter of Clayshard). Died while out hunting alone -- was chasing a snowshoe hare, and fell through the ice of a lake. Though he was able to struggle his way out of the water, he was exhausted and died of hypothermia before anyone could respond to his sends for help. Son of Meadowlark and Toss, brother of Dusk and Wren. 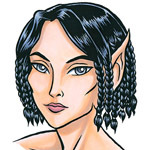 (Third Generation, 880-1450) - female, black hair, brown eyes. Huntress and tracker, elder. Weapons were spear, javelin, and knives. A skilled huntress who enjoyed stalking and the chase, and learning the ways of many different types of prey. Enjoyed challenging herself against difficult prey most of all, and approached a challenging hunt with the mindset that if she was injured or killed, it was a worthy battle that there is no shame in losing. Witty, somewhat sarcastic sense of humor; blunt, and honest, quick to speak her mind. Could seem harsh, but wasn't judgemental. Preferred things to be decided quickly, rather than a drawn-out debate. Could be analytical; enjoyed games and riddles. IHad many furmates and some lovemates, both male and female, but never really settled with anyone. Never Recognized or reproduced. Daughter of Javelin and Smoke. Half-sister of Sundaze, Longdusk, and Lure. 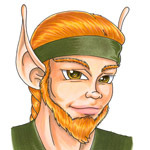 (Third Generation, 543-1290) -- male, red hair, green eyes. The oldest of the three siblings, Red was closer to his sister Foxsly than to his younger brother. Did not much take after his fiery father. Intelligent, with a wicked sense of humor; was not much of a hunter (particularly compared to his two siblings), but was very good at organization and at thinking through problems, although he was slow to make decisions. Recognized the strengths of his sister under her flighty exterior, and supported her as chief over Javelin. Saw himself in the role of advisor, and felt that Foxsly was much more likely to listen to advice and to delegate tasks she wasn't good at herself, than Javelin was. Son of Chief Burn and Sparrow, brother of Foxsly and Javelin. Recognized of Darkcurl, father of Dapple, Skyfire and Autumntide. 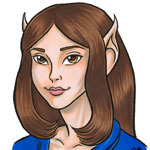 (Third Generation, 979-1514) -- female, brown hair, blue & green eyes. 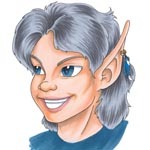 A playful, clever elf who loved music and who had a quirky, mischievous sense of humor. 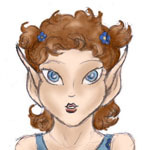 "Riversong" was actually first the name of her favorite harp; she herself went by the name Fishberry for many years, and assumed the name Riversong upon the instrument's destruction in RTH 1375. Died in a raging spring flood along with Harmony and Carver, only 12 years after the deaths of Foxsly and Crest. Daughter of Raft and Dawn, sister of Tanner. Recognized of Crest, mother of Hawkcall, Lacewing, and Snaptwig; possibly shared soul-names with Chieftess Foxsly. 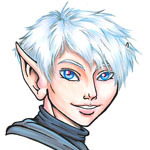 (Third Generation, 645-850) -- 5'1", white-gold hair, blue eyes. 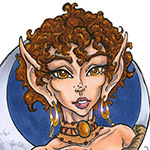 Despite her looks, the elfin side overweighed in Seafisher (thus the weak wolf bonding), but she respected and followed the way of the Now. She had a calm, quiet personality and a strong longing for the sea. 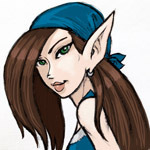 As a fisher she specialized in hunting at sea, in a boat or from the shore, with nets or her trident spear. She loved sitting at the beach watching the waves for hours. She did not actively seek company of others and rather enjoyed doing whatever and leaving whenever it hit her. When in company Seafisher was no spoilsport either, she enjoyed listening to stories and also contributing to discussions when she had something to say. She laughed easily, enjoyed a good joke, but was no prankster or jokester herself. 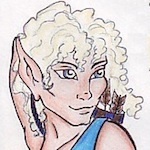 Daughter of Fisher and Deertracker, half-sister of Spearpoint, Darkcurl, Sentry, Surefoot, Longdusk and Lure. (Third Generation, 626-1412) -- male. Son of Bravestride and Deertracker, brother of Darkcurl and Spearpoint. Recognized of Thistle, father of Ice, Sunflare and Turtle. 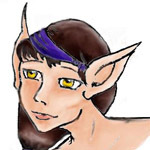 Bio picture by: Karena K.; color by Holly H.
(Third Generation, 718-1696) -- female. 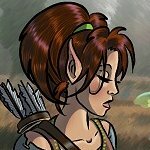 Softlock was a quiet, cautious woman who preferred the life of a crafter and herbalist over that of a huntress, although she was a skilled archer. Daughter of Feather & Badger, sister of Butterfly and Blue Jay. Recognized of Tanner, mother of Shyheart & Songsent. 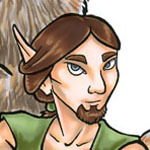 (Third Generation, 537-1563) -- male, ruddy brown hair, blue eyes. A genius crafter, Spearpoint learned to knap from Knifemaker, and improved upon her techniques. Spearpoint was mauled by a bear as a youth, and while he did not lose his sight or use of his arms, was partially crippled. He was an artisan who believed that even the most utilitarian of tools could be beautiful, yet could be fiercely traditional in other beliefs. Son of Deertracker & Bravestride, brother of Sentry and Darkcurl. Recognized of Butterfly, father of Strand and Stormdancer. 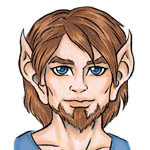 (Third Generation, 998-1066) -- male, brown hair, blue eyes. Died before ever Recognizing or breeding. Son of Squall and Ambergold, brother of Owl and Harmony, apprenticed to Swan as a weaver. (Third Generation, 986-1745) -- 5'6" male, black hair, blue eyes. Died during the distemper plague of 1745. Son of Flint and Blackbird, brother of Cloudchase. Recognized of Catnip, father of Sedge, Agate and Beesting. 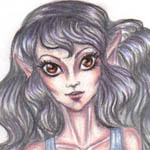 (Third Generation, 961-1075) -- female, dark-grey hair, violet eyes. Daughter of Raindrop and Hornet, sister of Thistle and Hailstone. Never Recognized nor reproduced. (Third Generation, 978-1189) -- male; brown hair, green eyes. Died before Recognizing or breeding. Died along with Ivy, Ambergold, and Blackbird during a bad summer forest-fire. Son of Sweetslip and an unknown father, born outside of Recognition. 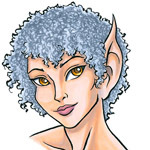 (Third Generation, 870-1130) -- female, silver-grey hair, gold eyes. Chiefly a tracker, but was also fascinated by food, a brewer, cook and relentless experimenter with ingredients and flavors. Something of a throwback, but the tribe often joked that all of Daze's exceptionally strong wolf-blood came from low-ranked wolves. Mellow and easy-mannered, very centred and relaxed in the Now, very Zen. Could drive even the most determined prankster mad with her good humour and ability to shrug off humiliation. A straightforward sort who often got lost if too much talk was going on, she knew that she wasn't the sharpest arrow in the quiver and was content as a follower leading as easy a life as she could manage. Could be blunt and crass, but if she offended, it was only because she was slightly too wolf-blooded to comprehend delicate situations and feelings. Only physical deprivation could really get her hackles up; became quickly obstinate and difficult when hungry, cold or tired. As Javelin's oldest cub, though, she was always pressured and a little intimidated by her father who was frustrated with her complete lack of ferocity and instinct for a fight. 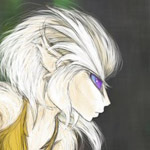 Daughter of Javelin and Raindrop; half-sister of Puma, Hailstone, and Thistle. Never Recognized nor reproduced. 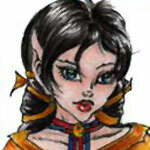 (Third Generation, 900-1520) -- female, black hair, grey eyes. Scout and trapper with a particular passion for climbing, rough terrain and testing herself against harsh conditions. A regular old sourpuss with a wry comment for every situation, Surefoot was fond of waxing poetic about potential possibilities for doom and gloom. She and Mushroom got on like a house on fire. 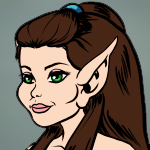 Could be a terrible tease and practised tough love with any younger elves facing confidence issues or relationship problems. Had a slightly embarrassing passion for tales of adventure, danger and daring escapes, and loved to have her own exploits recounted and glorified. Was rather pleased to have never Recognized in her years; never got on with cubs (too dour) and never thought motherhood would suit her. Daughter of Smoke and Fisher. Sister of Longdusk, Lure, and half-sister of Seafisher. 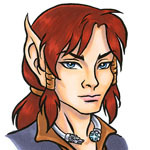 (Third Generation, 701-1611) -- male, red-gold hair, hazel eyes. Tanner was a reserved, calm man who enjoyed tanning and tailoring. Maybe have been among the first to brew dreamberries. Son of Dawn & Raft, brother of Riversong. Recognized of Softlock, father of Shyheart & Songsent. 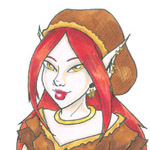 (Third Generation, 1077-1424) -- female, dark red hair, amber eyes. Daughter of Hornet and Raindrop, sister of Stormcloud and Hailstone. Recognized of Sentry, mother of Ice, Sunflare and Turtle. (Third Generation, 1035-1745) -- female; blond hair, green eyes. Died during the distemper plague of 1745. Daughter of Carver and Ivy, sister of Diamond. Recognized of Lure, mother of Cedarwing and Tangle. (Third Generation, 1109-1745) -- female, white hair, blue eyes. Died during the distemper plague of 1745. 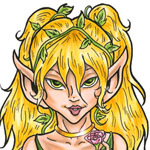 Daughter of Clawsharp and Rosepetal, sister of Growler and Catnip. Recognized of Longdusk, mother of Birch. 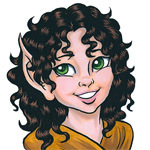 Bio picture by: art by Vicki S., colors by Holly H.
(Third Generation, 1163-1745) -- female, light brown hair, green eyes. Died during the distemper plague of 1745. Daughter of Toss and Meadowlark, sister of Pollen and Dusk. Recognized of Owl, mother of Dove, Melody, and Reed. (Fourth Generation, 1667-2154) -- female, brown hair, green eyes. Agate inherited her father's rock-shaping talent but was never as strong. A maternal, steady woman who enjoyed making jewelry and polishing semi-precious stones. Daughter of Catnip & Stoneback, sister of Beesting (a brother, Sedge, died long before her birth). Recognized of Dagger, mother of Bramble & Starskimmer. 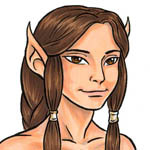 (Fourth Generation, 1270-2085) -- male, brown hair, blue eyes. Son of Red and Darkcurl, brother of Dapple and Skyfire. Recognized of Breeze, father of Cider and Boar. 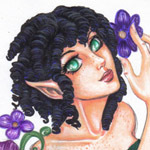 Bio picture by: art by Stacy L., colors by Holly H.
(Fourth Generation, 1708-2327) -- 4'7" female, black hair, amber eyes. Beesting was a friendly, outgoing soul who was always teased for her sweet-tooth. Athletic and active, disliked being alone. Died in flash flooding (along with Sunlight and Tallow) that took her hunting party by surprise. 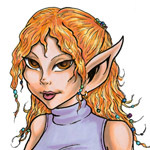 Daughter of Catnip & Stoneback, sister of Agate (a brother, Sedge, died long before her birht). Had a son, Raven, outside of Recognition with Owl, and then Recognized of Snaptwig (sons Bearheart and Fletcher). 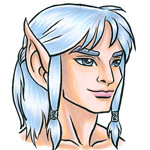 (Fourth Generation, 1476-1973) -- male, white hair, green eyes. Son of Longdusk and Whitebraid. Recognized of Whirlwind, father of Doeskin and Nettle. 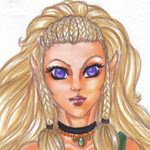 (Fourth Generation, 1365-2086) -- female, white-blond hair, amber eyes. Daughter of Carver and Harmony. Recognized of Autumntide, mother of Cider and Boar. 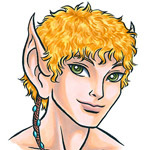 (Fourth Generation, 1293-2097) -- male, blond hair, green eyes. 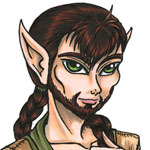 Cedarwing was a plantshaper and a hunter, who had an elder's wise counsel even as a relatively young elf. 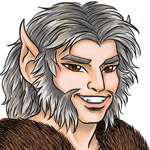 While out on a far-ranging hunting trip with his family, was killed by humans (called the Fierce Ones), along with lifemate Shyheart, son Lynx, and Lynx's lifemate Frost (Farscout and Cloudfern survived, along with Brightwood, who was mortally wounded and put into wrapstuff). The son of Vine & Lure, Recognized of Shyheart, father of Lynx, Sunlight & True Edge. (Fourth Generation, 1774-2176) -- male, brown hair, brown eyes. 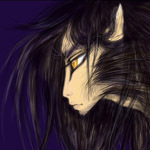 Dagger favored his wolf heritage more than his elf blood. Hunter and tracker. Could be very short-tempered, had a cutting (and not always kind) sense of humor. 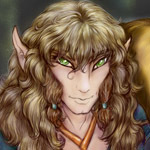 The son of Burr & Huntwise, Recognized of Agate, father of Bramble & Starskimmer; also Recognized Songsent, father of Rhythm. (Fourth Generation, 1027-1035) -- female. Died as a child, circumstances tbd. 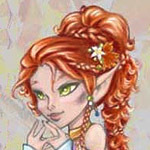 The daughter of Darkcurl & Red, sister of Autumntide and Skyfire. 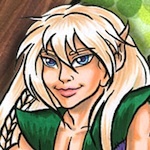 Bio picture by: Valkyrie, color by Holly H.
(Fourth Generation, 1357-1870) -- male, blond hair, blue-green eyes. Son of Carver and Harmony. Recognized of Summer, father of Seafoam, Dreamberry, and Ringtail. Died in an avalanche near Bluestone Cave, along with his lifemate Summer. 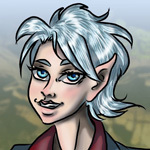 Bio picture by: Melanie D., color by Holly H.
(Fourth Generation, 1609-1930) -- female, silver-grey hair, blue eyes. 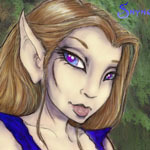 Daughter of Owl and Wren, sister of Melody and Reed, Recognized of Wolfmane (mother of One-Leg and Blacksnake), and later Recognized of Skinner (mother of Suddendusk). (Fourth Generation, 1251-2325) -- 4'6", blue-grey eyes, light brown/blond hair. Beloved and respected chieftess for over 800 years. 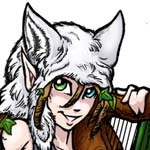 Very intelligent and, unlike her mother and the tribe's previous chieftains, Easysinger was far more centered in "elf" than "wolf." She was a deep-thinker and a long-range planner, who distrusted what she considered the false comforts of "Now". Much beloved for her nurturing, wise-elder role, but had a spine of steel and an iron will. Could be a subtle manipulator and had submerged in her a broad streak of cunning. 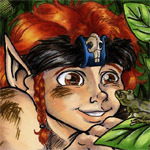 Recognized with two lifemates: Oakhand (with whom she had one daughter, who died young), and Blacksnake (three children: Riskrunner, Windburn, and Chicory). (Fourth Generation, 1423-2097) -- 4'2" female, H=silver-white; Eyes=ice-blue. A quiet, reserved person with a wry, understated sense of humor. Independent, has little patience for fools; can be impulsive but also has a wide streak of common sense. 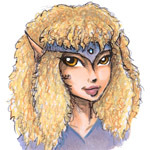 Daughter of Foxsly & Reedweaver, sister of Easysinger & Leather, Recognized to Lynx, mother of Brightwood & Cloudfern. (Fourth Generation, 1180-1729) -- male, light brown hair, blue eyes. 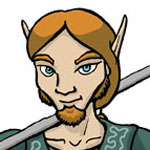 A clever, arrogant archer who could be difficult to get along with, Hawkcall was a canny hunter and explorer. Son of Riversong & Crest, Recognized of Ice, father of Farscout. 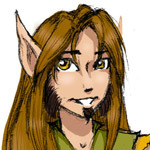 (Fourth Generation, 1416-2005) -- male, light reddish-brown hair, blue-green eyes. 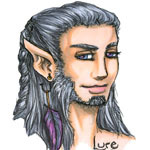 Son of Longdusk & Minx, Recognized of Tangle, father of Tallow. (Fourth Generation, 1205-2208) -- 4'8" female, H=black/bald, E=grey. A sober, serious woman who had compulsive work habits; a skilled gold/silversmith who took up the craft from her mentor Cloudchase. 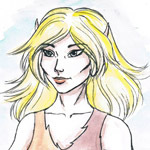 Daughter of Sentry & Thistle; sister of Sunflare and Turtle; mother of Farscout & Goldspice (recognized twice, to Hawkcall & Riskrunner respectively, but never lifemated). (Fourth Generation, 1743-1745) -- female, light brown hair, blue eyes. Died as a very young child, during the winter plague of RTH 1745. Daughter of Burr & Huntwise, sister of Dagger. 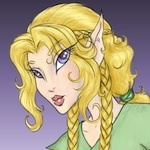 (Fourth Generation, 1366-2003) -- female, honey-blond hair, blue eyes. Physically delicate, Lacewing was lifemated to both of her Recognized; Newt, her youngest, was born outside of Recognition. Was a skilled weaver of both silks and other textiles. After her death (how she died is currently unknown), Turtle and Strand became estranged, blaming each other for her loss. Turtle followed her in death within six months, but Strand survived for over a hundred more years. Daughter of Riversong & Crest, sister of Hawkcall & Snaptwig, Recognized of Turtle & Strand, mother Tossfur, Birdcatcher, and Newt. 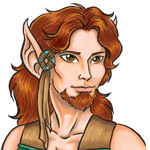 Bio picture by: art by Yve S., colors by Holly H.
(Fourth Generation, 1497-2365) -- 4'8" male, chestnut hair, hazel eyes. 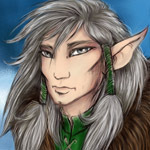 Son of Chieftess Foxsly & Reedweaver, brother of Easysinger & Frost; Recognized of Stormdancer, father of Kestrel, Moon & Fadestar; grandfather of Bowflight; great-grandfather of Willow & Pathmark. A calm and wise tanner, skilled tracker. (Fourth Generation, 1737-1745) -- male, brindle grey-brown hair, dark brown eyes. Died as a child during the winter plague of RTH 1745. Son of Piper & Hailstone, brother of Wolfmane & Whirlwind. (Fourth Generation, 1687-1745) -- female, white hair, blue eyes. 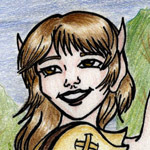 Melody was a sweet-natured fisher who enjoyed singing and music of all forms. Favored her elf-blood, and was showing the first signs of her father's healing talents when she died of illness & exhaustion during the winter plague of 1745. Daughter of Wren & Owl, sister of Dove and Reed. (Fourth Generation, 1736-1745) -- male, silver-grey hair, blue-grey eyes. 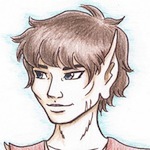 A clever child who favored his elf-heritage stronger than the wolf-blood. Reed always yearned for a wolf-friend; died during the winter plague of RT 1745, before he could bond. Son of Owl and Wren, brother of Dove and Melody. 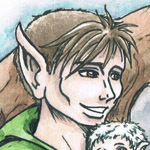 Sedge (Fourth Generation -- 1402 to 1406)-- male, brown hair, blue eyes. Sedge was a cheerful and fearless cub, who died at a tender age from a fall from a Dentree window. Parents Catnip and Stoneback; two sisters, Beesting and Agate, were born long after his death. 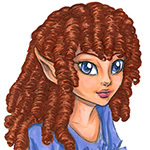 (Fourth Generation, 1268-2097) -- female, light brown hair, blue-violet eyes. 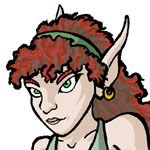 Shyheart was a crafter and herbalist. True to her name, Shyheart was quiet and often outwardly reserved, and disliked bloodshed. 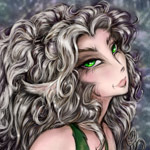 While out on a far-ranging hunting trip with her family, was killed by humans (called the Fierce Ones), along with lifemate Cedarwing, son Lynx, and Lynx's lifemate Frost (Farscout and Cloudfern survived, along with Brightwood, who was mortally wounded and put into wrapstuff). 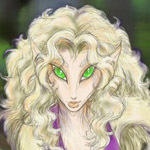 Daughter of Softlock & Tanner, Recognized of Cedarwing, mother of Lynx, Sunlight, and True Edge. 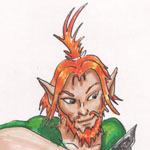 (Fourth Generation, 1278-1860) -- male, red-gold hair, green eyes. Son of Cloudchase & Herbfinder, brother of Summer, Recognized of Dove, father of Suddendusk. 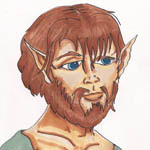 (Fourth Generation, 1281-1334) - 4'9" male dark brown hair, blue eyes. A young roamer who particularly enjoyed exploring the coastlines in a kayak; a long-distance scout, often gone for long periods of time. Tends to have a small group of friends with whom he forms strong attachments. Weapons are bow and spear. Musically inclined, including singing, harp/lute and drums. Particularly good at early sensing of weather changes and approaching storms. Never Recognized or reproduced. Son of Darkcurl and Red, siblings Dapple and Autumntide. (Fourth Generation, 1500-2278) -- 4'9" male, brown hair, blue eyes. Snaptwig was an impulsive trapper and fisher, who had a keen wit and an even keener sense of humor. Son of Riversong & Crest, brother of Hawkcall and Lacewing. Recognized of Beesting, father of Bearheart & Fletcher. (Fourth Generation, 1350-1901) -- female, light brown hair, gold eyes. 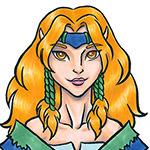 Daughter of Softlock & Tanner, sister of Shyheart, Recognized of Dagger and mother of Rhythm. (Fourth Generation, 1549-2355) -- female, black hair, grey eyes. 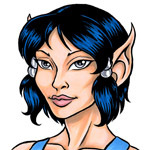 A strong glider, Stormdancer was named for her joy in aerial dances during thunderstorms. A temperamental, impulsive woman who never shied away from an argument. Died of complications from childbirth, a few days after the birth of Fadestar. Daughter of Butterfly & Spearpoint, sister of Strand, Recognized of Leather, mother of Kestrel, Moon & Fadestar. 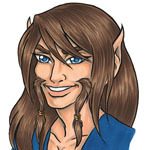 (Fourth Generation, 1201-2160) -- male, ruddy-brown hair, blue eyes. Did not inherit his mother Butterfly's gliding talent. An artist and jewelry-designer (not a metal-worker), Strand was the one who started the mural of the tribe's history that decorates one of the walls of the chamber in which the wrapstuffed members of the tribe sleep. After Lacewing's death in 2003 (how she died is currently unknown), he and Turtle became estranged, each blaming the other for her death. Turtle followed Lacewing in death within six months, but Strand survived for over a hundred more years. Son of Butterfly & Spearpoint, brother of Stormdancer. In a three-mating with Lacewing and Turtle; Recognized with Lacewing, father of Birdcatcher; possible father of Newt. 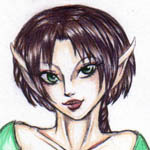 Bio picture by: art by Melanie D., colors by Holly H.
(Fourth Generation, 1396-1870) -- female, black hair, sea-green eyes. Daughter of Cloudchase & Herbfinder, sister of Skinner, Recognized of Diver, mother of Dreamberry, Ringtail & Seafoam. 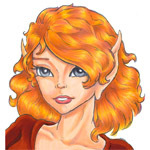 (Fourth Generation, 1302-1727) -- 4'5" female, red hair, gold eyes. Liked the direct approach, and liked to get one in return, too, but didn't always think before she spoke. Did not hesitate to speak her mind when something came up that she believed needed to be discussed, and did not shy away from arguments. Sometimes it was not really clear if she meant what she said, or if she was joking, when she threw subtle sarcasm in the mix. She was convinced that the way of the wolfriders and living in the "Now" were the best ways to live. She rather preferred to hunt than to stay home and play guard; she loved the excitement and chase. Somewhat of a thrill-seeker and was always up for a dare. Loved jewelry. Very skilled with the whip and axe, but hunted with a spear, too. Never Recognized or reproduced. Daughter of Thistle and Sentry, sister of Ice and Turtle. 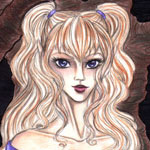 (Fourth Generation, 1398-2009) -- female, blond hair, violet eyes. 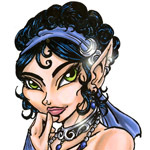 Tangle was a free-spirited huntress who was admired for her beauty; one of the "Starskimmers" of her generation. 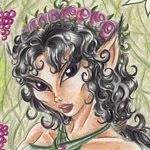 Daughter of Lure & Vine, Recognized of Hooksharp, mother of Tallow. 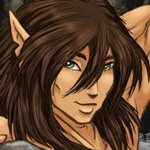 (Fourth Generation, 1381-2004) -- male, brown hair, brown eyes. 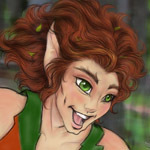 This cheerful, stout elf had far more heart than wit. Rendered deaf by a fever later in life, was a skilled carver and fisher, enjoyed pottery as well. After Lacewing's death in 2003, he and Strand became estranged. His death followed Lacewing's by six months; he became withdrawn, a shadow of his former self, and his body was eventually discovered covered in beestings. Son of Thistle & Sentry, brother of Ice and Sunflare, Recognized of Lacewing, three-way mated with her and Strand; father of Tossfur; possibly father of Newt. (Fourth Generation, 1485-1930) -- female, brindle red-brown hair, green eyes. 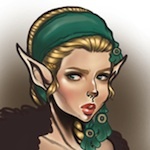 Daughter of Piper & Hailstone, sister of Wolfmane & Magpie, Recognized to Birch, mother of Doeskin & Nettle. A temperamental personality. Whirlwind was bitten by a snowmouth snake in RTH 1812; while she didn't lose her leg, she did sustain a crippling scar that resulted in a limp for the remainder of her years. 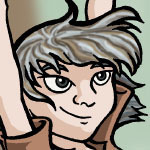 (Fourth Generation, 1246-1745) -- male, brindle grey-brown hair, brown eyes. Died during the distemper plague of 1745. Son of Hailstone and Piper; Recognized of Dove, father of One-Leg and Blacksnake. 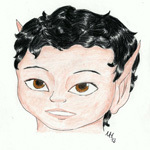 (Fifth Generation, 1818-2484) -- 4'4" male, black hair, blue eyes, powerful build. Bearheart was a hearty, bearded hunter who was respected for his skills with a spear as well as for his knapping. 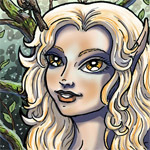 During a second year of drought, a forest fire overtook two hunting parties before they could reach safety; was killed along with five other elves (Dreamberry, Cider, Rhythm, Birdcatcher & Ringtail). The son of Beesting & Snaptwig, brother of Raven & Fletcher, Recognized of Dreamberry, father of Snowfall, Whispersilk & Nightstorm. 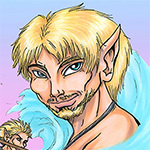 (Fifth Generation, 1751-2484) -- male, honey-blond hair, blue eyes. 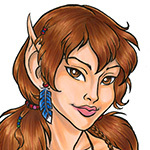 During a second year of drought, a forest fire overtook two hunting parties before they could reach safety; was killed along with five other elves (Bearheart, Dreamberry, Cider, Rhythm, & Ringtail). 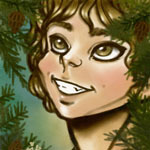 Son of Lacewing & Strand, half-brother of Tossfur & Newt, Recognized of Tallow and father of Thornbow & Honey. (Fifth Generation, 1763-2079) -- male, blond hair, grey eyes. Killed while hunting. 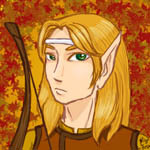 Son of Breeze & Autumntide, brother of Cider, Recognized of Kestrel, father of Bowflight. 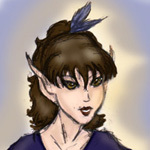 Bio picture by: art by Megan M.
(Fifth Generation, 1902-1909) -- female, auburn hair, blue-green eyes. 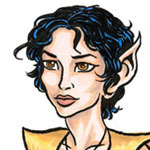 Bramble was a cheerful, temperamental child who died at the age of seven, over 20 years before the birth of sister Starskimmer. Daughter of Agate & Dagger, sister of Starskimmer; half siater of Rhythm. (Fifth Generation, 1744-2484) -- female, white-gold hair, brown eyes. 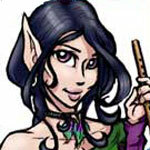 A brewer, fisher, skilled fish-archer, musician and crafter of art objects, with a bubbly personality. Loved baubles and jewelry. 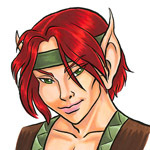 During a second year of drought, a forest fire overtook two hunting parties before they could reach safety; was killed along with five other elves (Rhythm, Dreamberry, Bearheart, Birdcatcher & Ringtail). Daughter of Breeze and Autumntide, sister of Boar, Recognized of Rhythm, mother of Moss. 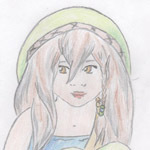 Bio picture by: art by Stacy L.
(Fifth Generation, 1849-2362) -- female, light brown hair, hazel eyes. A skilled tanner and tailor. Killed by the bite of a poisonous spider, that caused her to die in her sleep. Daughter of Whirlwind and Birch, sister of Nettle; lovemate of One-Leg; Recognized of Ringtail, mother of Rainpace. 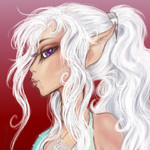 Bio picture by: Peggy B., Annika K. & Mareike H.
(Fifth Generation, 1748-2484) -- female, white hair, green eyes. 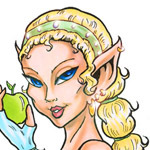 Dreamberry was a cheerful soul who was both an accomplished brewer and weaver. 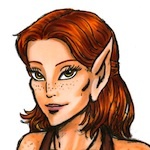 During a second year of drought, a forest fire overtook two hunting parties before they could reach safety; was killed along with five other elves (Bearheart, Cider, Rhythm, Birdcatcher & Ringtail). The daughter of Diver & Summer, sister of Ringtail and Seafoam; Recognized of Bearheart, mother of Snowfall, Whispersilk & Nighstorm. 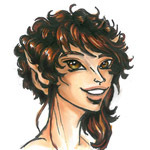 (Fifth Generation, 2187-2503) -- 4'4", dark brown hair, grey eyes. Cheerful, good-natured hunter, archer, tracker, fletcher (obviously) and bowyer. Was gravely injured, trampled by a branch-horn during a hunt, and put into wrapstuff in 2269; died upon being unwrapped, before Willow could heal him. Uncle of Snowfall, Nightstorm, and Whispersilk. 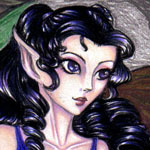 (Fifth Generation, 1743-1745) -- female, dark brown curly hair, dark green eyes. Hope was a shy, intelligent child who died during the peak of the 1745 winter plague. Daughter of Easysinger & Oakhand. (Fifth Generation, 1312-2097) -- 4'8", H=blonde, E=green. Arrogant and honest, but in a playful, roguish way that many found charming. Very intelligent and observant, possessed of a restless mind. Lives every minute of his life. Soul-brother of Blacksnake. Father Cedarwing, Mother Shyheart. Siblings True Edge and Sunlight. Recognized and lifemated to Frost. Daughter Brightwood, son Cloudfern. Soul-brother to Blacksnake. (Fifth Generation, 1747-2010) -- female, white hair, grey eyes. 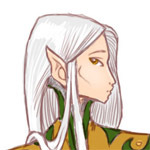 Moon was a self-confident, witty young huntress & fisher, who had her mother's flashfire temper and impulsiveness and who waited (unsuccessfully) her entire life to develop her mother's gliding ability. Never Recognized or bred. Close friend and sometime-furmate of Tossfur, before he Recognized and lifemated with Nettle; Tossfur had hoped for an eventual lifemating, but Moon didn't want to den full-time with someone who showed throat so easily, claiming that she'd get bored. Killed while hunting. Daughter of Stormdancer & Leather, sister of Kestrel & Fadestar. (Fifth Generation, 1882-2237) 4'0" female, strawberry blond hair, brown eyes. 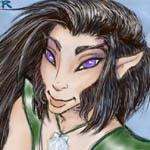 Daughter of Whirlwind and Birch, sister of Doeskin; Recognized of Tossfur, mother of Greenweave. 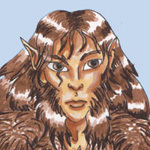 Bio picture by: Linda A., color by Holly H.
(Fifth Generation, 1802-2484) -- male, brown hair, amber eyes. 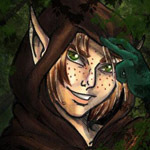 During a second year of drought, a forest fire overtook two hunting parties before they could reach safety; was killed along with five other elves (Cider, Dreamberry, Bearheart, Ringtail, & Birdcatcher). 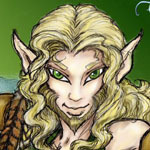 Son of Songsent & Dagger; half-brother of Bramble and Starskimmer; Recognized of Cider, father of Moss. 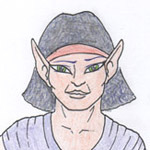 (Fifth Generation, 1773-2484) -- male, dark brown hair, blue eyes. 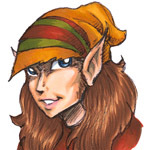 During a second year of drought, a forest fire overtook two hunting parties before they could reach safety; was killed along with five other elves (Dreamberry, Bearheart, Cider, Rhythm, & Birdcatcher). Son of Summer & Diver, brother of Seafoam and Dreamberry; Recognized of Doeskin, father of Rainpace. (Fifth Generation, 1965-2210) -- male, white hair, blue-grey eyes. 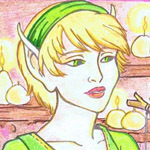 True to his name, this self-confident elf was adept at getting himself into and out of trouble. Rash and often impulsive, but also clever and charismatic. 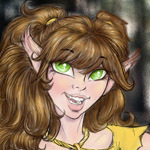 Was a sometime-furmate of Nettle, before she Recognized and lifemated with Tossfur. Killed suddenly while on a hunt, when a tuftcat erupted from its den and slashed through his throat. Oldest son of Easysinger & Blacksnake; father of Goldspice, Recognized of Ice. (Fifth Generation, 1740-1745) -- female, silver hair, sea-green eyes. Seafoam died as a small child during the RTH 1745 winter plague. Daughter of Summer & Diver, sister of Dreamberry & Ringtail. (Fifth Generation, 1746-2327) -- 4'7" female, blond hair, blue-green eyes. Sunlight was a calm and self-confident maternal figure who at times exhibited an impulsive streak. Died in flash flooding (along with Beesting and Tallow) that took her hunting party by surprise. Daughter of Cedarwing & Shyheart, sister of Lynx & True Edge, Recognized of Raven, mother of Finch & Windsong. (Fifth Generation, 1845-2327) -- female, blond hair, yellow-green eyes. Tallow was a skilled crafter who hated waste of any type. Died in flash flooding (along with Sunlight and Beesting) that took her hunting party by surprise. Daughter of Tangle & Hooksharp, Recognized of One-Leg (had Flash) & Birdcatcher (had Thornbow & Honey). 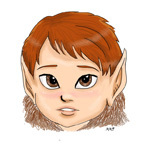 (Fifth Generation, 1817-2299) 4'2" male, brown hair, green eyes. Son of Lacewing & Turtle, brother of Birdcatcher & Newt, Recognized of Nettle and father of Greenweave. (Sixth Generation, 2012-2489) -- male, blond hair, green eyes. Killed in a mudslide/rockslide. Son of Kestrel and Boar. Recognized of Finch, father of Willow and Pathmark. 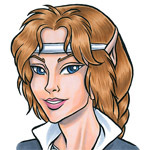 (Sixth Generation, 2096-2368) -- female, light blond=brown hair, amber eyes. 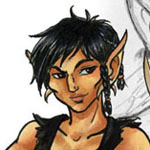 Finch was a calm, cautious woman who nonetheless was an avid hunter who skillfully wielded a large axe. Admired for her wonderful singing voice and flute-playing (hence the name). Killed by a mountain-cat. 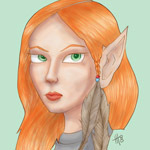 Daughter of Sunlight & Raven, sister of Windsong. Recognized of Bowflight, mother of Willow and Pathmark. 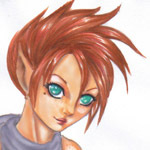 (Sixth Generation, 2118-2332) -- 3'9" female, red hair, green eyes. Daughter of Tallow & One-Leg. A temperamental huntress who enjoyed getting into � and out of � dangerous scrapes. In a threeway lovemating with Whitestag & Fletcher. Died without Recognizing or reproducing. 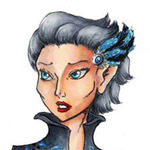 (Sixth Generation, 2288-2504) 3'8" female, black hair, aqua eyes. Daughter of Dreamberry and Bearheart, Recognized of Windburn mother of Foxtail and Cinder, sister of Snowfall & Nightstorm. 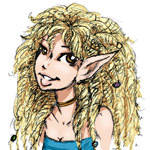 Whispersilk was a quiet and dedicated (almost obsessed) crafter, the tribe's latest expert in creating silk thread from Preserver webbing and weaving it into cloth and rope. Sometimes tempermental, she was somewhat neglectful of her first child, Foxtail, but vowed to do better by her second child, Cinder. She never got the chance, however, killed a few months after his birth by a tree toppled in an ice-storm. 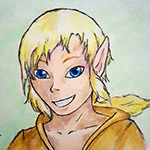 Bio picture by: Chrissy W.
(Seventh Generation, 2097-2486) -- 4'2" male, blond hair, blue eyes. A "Golden-Child" who possessed all of the best qualities of both his parents. A bit more diplomatic and tactful than his father, thanks to the calm, cool nature of his mother. Whitestag had his father's determination, loyalty, dependability, and thick skin. A born problem-solver, he relied mainly on his cognitive skills rather than instinct. An enthusiastic fighter as well as a lover. Had a fondness for feathers. Very close to sister Quick Fang, often a tempering influence on her. Killed in a fall from cliffs while hunting mountain goats. Bio picture by: Hannah B.